Successfully Added Portable Multimedia DVD Player with 10 Inch Swivel Screen to your Shopping Cart. The new and improved CVIB-E149 comes with everything you need to stay entertained during those long road-trips or cross-country flights. Highlights include a crystal clear 10 Inch widescreen display- perfect for watching DVDs on, USB and SD card ports for quickly accessing your movies, photos and music, TV receiver and 180 degree swivel-screen for easily adjusting to the perfect viewing angle every time. The great part is that this portable DVD player is small enough to easily bring just about anywhere you go. Slip it into your backpack and bring it to the park, take in on the bus, or bring it to your grandmother’s house to keep the kids entertained. The E149 also comes with a powerful pair of 1 watt stereo speakers (2 watts total) that are loud enough to use in noisy environments such as the bus or train station. 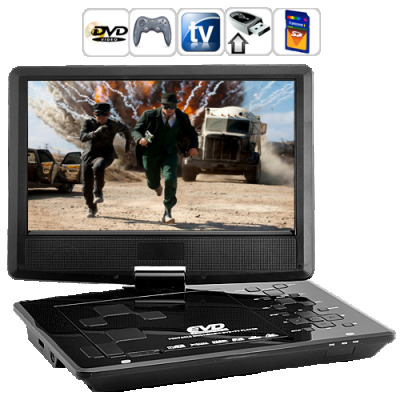 Looking for a highly portable multimedia DVD player? Then look no further than the E149. Get yours now at our direct from the factory wholesale price and in a few short days you can enjoy your brand new 10 inch multimedia DVD player and say goodbye to the boring idle time in your day. And don’t forget, the E149 is fully backed by our 12 month warranty and is in stock now and ready to ship within 24 hours.